I'm a big fan of the foil method of glitter polish removal, but the idea of a peel-able base coat is a total game changer! I've heard of a couple different ones, and even of just brushing on some good ol' Elmer's, and I kept saying, "Yeah, I'm totally gonna try one of those soon..." Then OPI introduced their own, and the time for procrastination was over--let the time for product testing begin! I wear glue on my nails; I look incredible. OPI Glitter Off Base Coat comes with a little slip of instructions around the neck, instructions that say you should use thin coats. Easier said than done because it went on thick, like glue...which, duh, since that's pretty much what it is. It needs a little longer to dry than most base coats, and the instructions do say to let it dry completely. It's easy enough to see what that's done, though; the opaque, milky white dries nice and clear. My first test was with Pure Ice Private Show, a finely milled glitter that was a perfect candidate. Application over this base didn't present any problems, and once the polish was dry, the wear test was on! Unfortunately, my right hand was chipping like mad inside of a day. Suddenly a wild Cinderella hand appears! I wouldn't want to generalise based on just this one trial with this one polish. 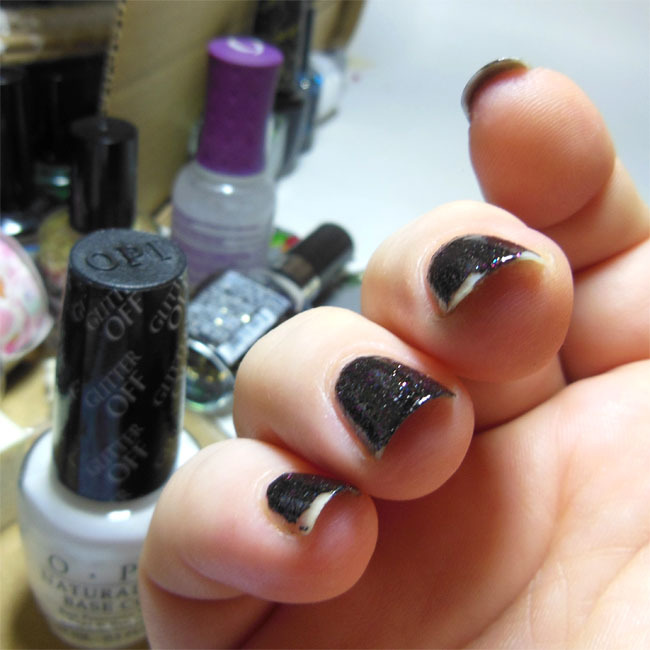 The other hand, which got a second helping of top coat for the camera, didn't have the same chipping problem. But, I read more than one review of OPI Glitter Off Base Coat that reported an entire nail of polish just randomly falling off, and sure enough, my right index disappeared after about 18 hours (which I noticed while I was eating a piece of the spinach pizza I made us for dinner; I can only hope I didn't swallow the thing...). A second, from non-chipping Lefty, popped off whole at a little over a day, around 30 hours in. So I can't really rave about the wear, but the removal? Wonderfully, gorgeously, ridiculously easy. I just pushed/slid an orange stick under an edge of the polish, and the polish pretty much fell away in a sheet. A couple of nails needed more...it's way too light to call it scraping, just a little extra encouragement, and then I went over all the nails with some polish remover to get any traces of whatever might be left over. Done and dusted. A total breeze. My next couple of trials went a little differently. For this composite manicure, I used OPI Glitter Off Base Coat under a Liquid Sand, wondering how it might work, and while it held well--no chipping or popping off in the 2 days I wore the manicure--I was unable to peel the polish off the way I did when I used it under actual glitter. It came off super easy with remover, but it just wasn't having any part of the peeling protocol. 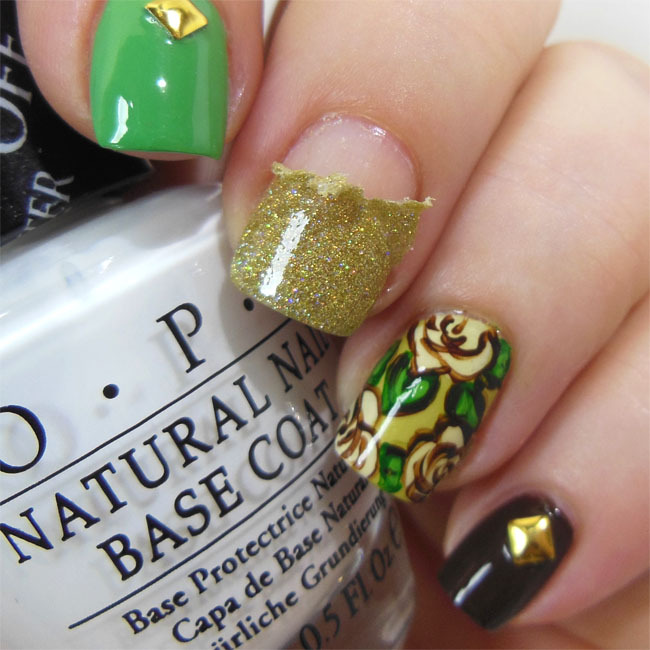 I had a similar result with the fine, full-coverage glitter I used on my middle nail with this manicure. After the base coat, 2-3 coats of finely milled glitter, then 2-3 top coats, a simple peel-off just wasn't gonna happen; however, I was able to peel and push it up with an orange stick (without any worry that I was going to damage the actual nail) and then remover away the residue. Some of my mixed results seem to stem from the "use thin coats" part of the instructions. It's hard to get a nice, thin coat of what's essentially Elmer's on your nails, but I did get it a little thinner after a couple of tries. Thing is, I suspect there's a fairly narrow window of optimal thickness where adhesion and durability really intersect. Until and unless I can get better at hitting that hold/peel butter zone, here's my conclusion: I think OPI Glitter Off Base Coat is a great choice for those evenings you want to go big & glittery for a party or something, assuming you don't need the manicure to last a very long time. Considering the chipping, I'll probably save it for those occasions--and for swatching glitters, which it should be a huge help for!--and stick with a regular base + the foil method for normal/daily wear. Great review, I always planned on getting one of these but at the end of the day I'd sooner have my nail polish last perfectly throughout the day and use the tinfoil method for removal if it's a glitter polish. I don't think I'd get as much use out of it in the long run. I wonder if the formula will get thicker as it gets older too? That would be a nightmare! Great review on this! I've never used this or anything like it so its great to hear what you thought of it.